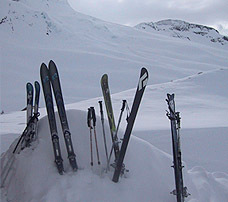 In the early stages of the website, we, the developers of Backcountryskiingcanada.com, have focused on the backcountry skiing locations we know best: the West Kootenay touring routes nearby. As more people visit the site, we’ll get information about great backcountry skiing locations throughout canada—as well as backcountry skiing locations in the area we may have missed. This is where you come in. By submitting a new backcountry skiing route, you’ll be contributing to the sport of backcountry skiing and promoting the safe travel of people like us. Because we are interesting in high-quality information, we ask you a few basic questions below which will make submitting easier for you and help us keep things consistent. Please include as much information as you can think of. The more we have the better. Thanks very much for your input and keep exploring! you can make one up! please share any information that will help people ski the route. Things like trailhead location, uptrack direction, possible descents, landmarks, etc.